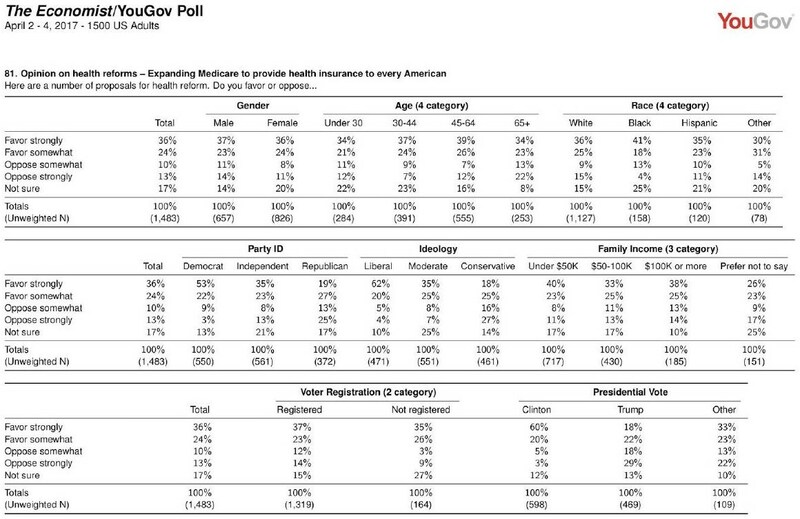 75% of Democrats, 60% of Independents, and 46% of Republicans favor single payer healthcare. Here is an article elaborating on this poll. 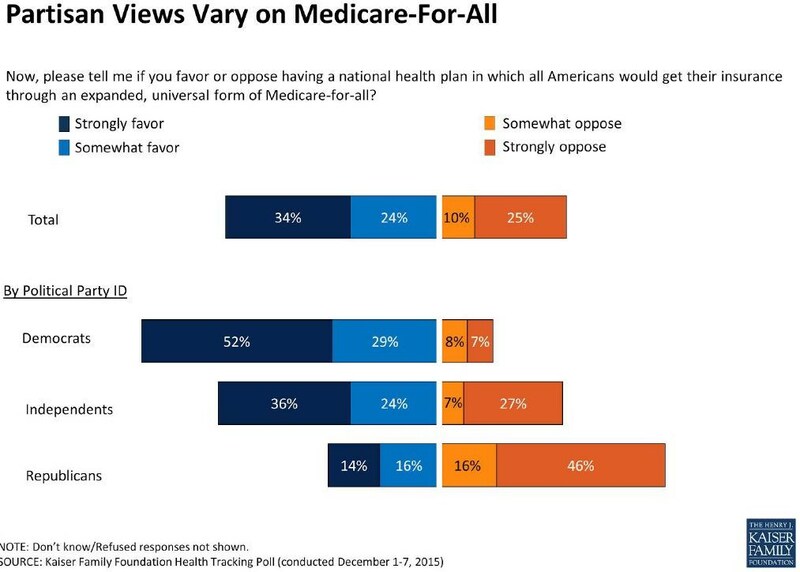 Republican support for Medicare for All has significantly increased in the past two years. From 2015 Kaiser Family Foundation poll. From page 2 of 2010 U.S. Department of Health and Humans Services study. Single payer healthcare uncouples healthcare from employment. It unchains people from having to stay at a job in order to prevent losing coverage. 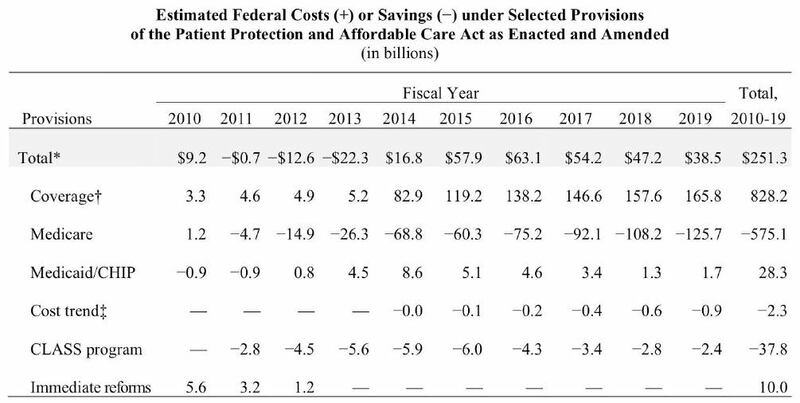 The Urban Institute and the Tax Policy Center have released an analysis of the costs of Bernie Sanders’ domestic policy proposals, including single-payer national health insurance. They claim that proposals would raise the federal deficit by $18 trillion over the next decade. To put it bluntly, the estimates are ridiculous. 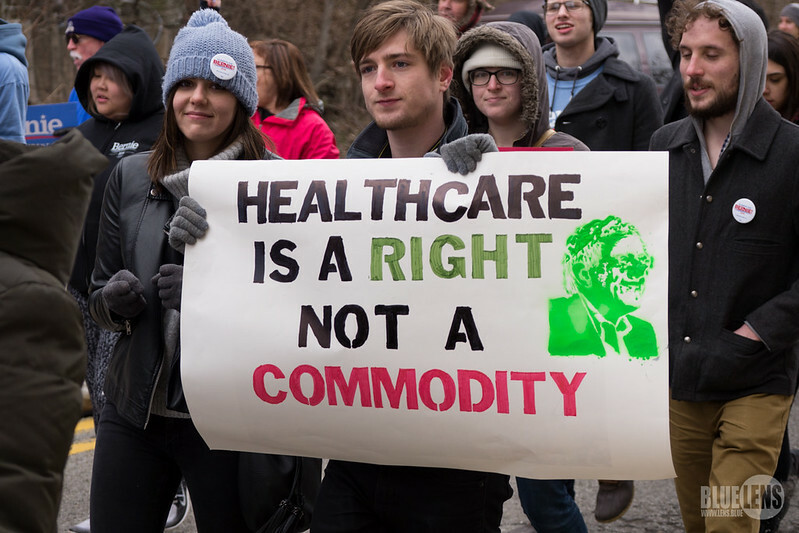 They posit outlandish increases in the utilization of medical care, and ignore vast savings under single-payer reform, and ignore the extensive and well documented experience with single-payer systems in other nations — which all spend far less per person on health care than we do. [T]he nation’s largest, most broadly-supported conservative research and educational institution—a think tank—The Heritage Foundation has been the bastion of the American conservative movement since our founding in 1973. Insurance is meant for things unlikely to happen. Non-emergency healthcare is a common, regular occurrence for everyone. Insurance for a common regular thing is nonsensical. Profit off of people’s pain and suffering is immoral. The medical insurance industry is built on profiting off of sickness and injury.